I would like (maybe very shortly) to move the system and applications to a new SSD drive (perhaps 120GB or 240GB size). So, given that the C: (system) partition has only 30 GB used (~896 GB of total size), one of the first configurations I wanted to do with my new laptop was shrinking this partition to 120 GB. The problem was that, after performing the shrinking, I could reduce the size only to ~460GB (not enough for my purposes). So, the problem (at least one of them) seems to be a file in “System Volume Information”. After restarting the system, the changes were applied. I could then shrink to the size I wanted! 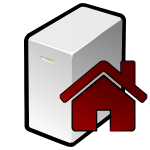 3rd party tools are able to manage these “unmovable files” but if you want to avoid using one of those solutions, simply by disabling temporary these features the shrinking you want could be possible. 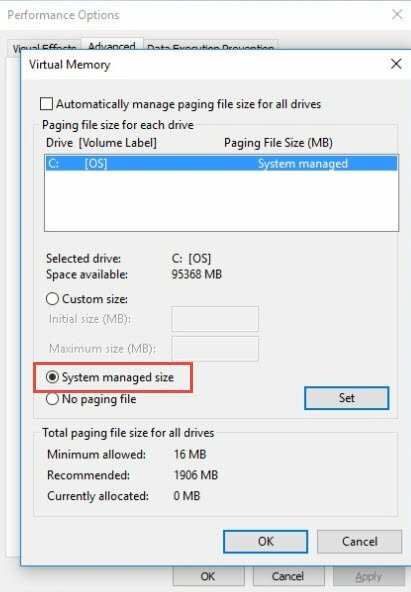 This entry was posted in Windows and tagged partition, ssd, windows by Sysadmin SomoIT. Bookmark the permalink. this all worked for me. thanks! 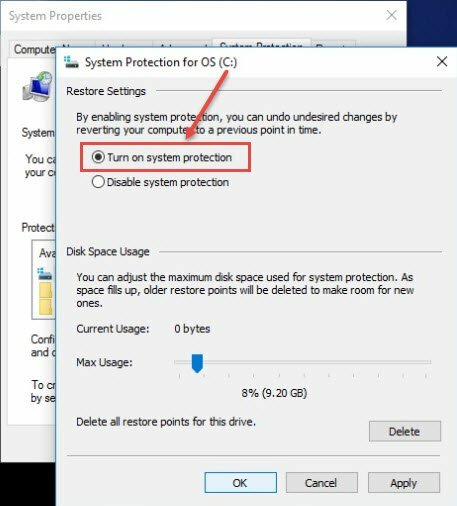 Will it harm my windows 10 (genuine)? Or it is safe? it didn’t worked for me. 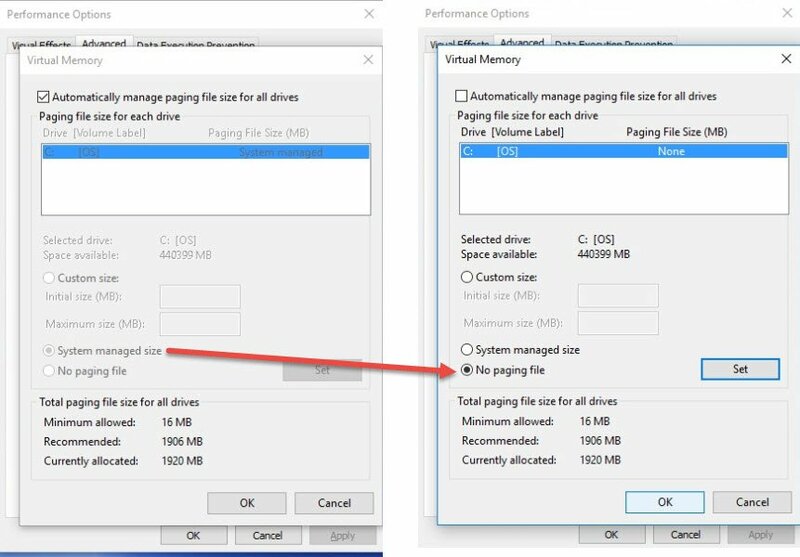 even after doing all the steps it’s still showing not enough space on drive to perform this action. Have you checked the events? Maybe some “defrag” events? I was trying to create a 100 GB Linux partition . But my stubborn C:\ refused to give me more than 40GB. Thanks to your website, I was able to create that 100GB partition…. Your explanation was helpful and super easy to follow!!! I try to create easy-to-read posts. Hi, Thanks a lot !!! It was so helping me to shrink the volume. 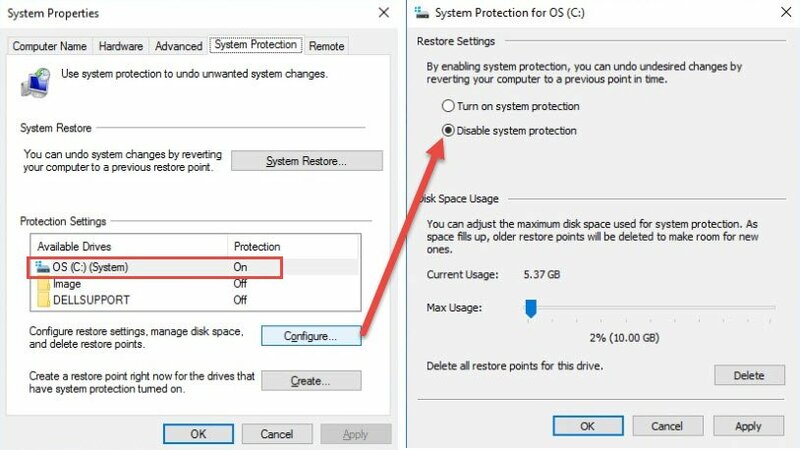 Excellent tutorial- I followed it and temporarily disabling System Protection and the pagefile worked perfectly for me. Thank you! I have tried to do all the steps.but still not able to shrink. “A volume shrink analysis was initiated” … and you will see some diag details. Important part is Last unmovable fie. You need to delete this file. In my case it was windows.ebd file, created by Windows Search service. Go to Control Panel > Indexing options > Advanced > click Rebuild. Run shrink again and check the analysis log again. Thank you very much, it worked on my computer. 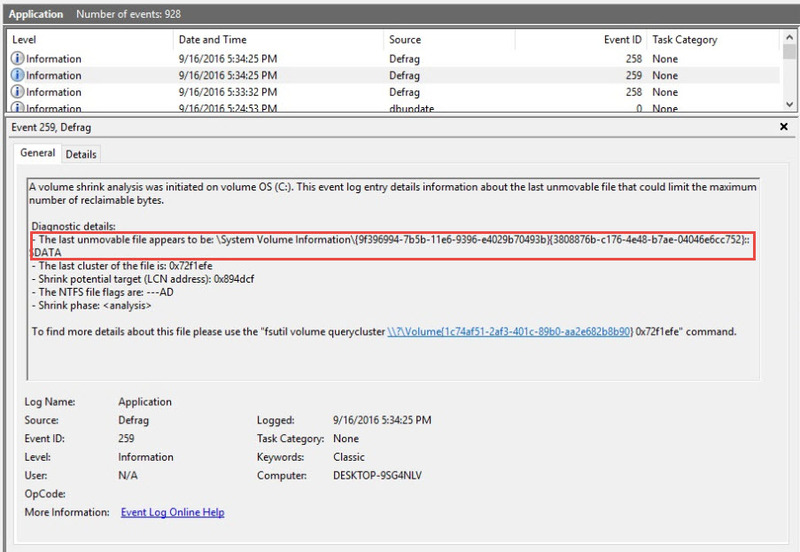 I discovered that to get the information about the last unmovable file in “defrag” messages in event viewer –> windows logs–> applications, you need the warning message with event id = 260. However, when I was trying to shrink my C: drive by 100GB, no such message would appear in event viewer. When I tried to shrink by 2GB however, it showed up and told me exactly which file was crashing the process (last unmovable file). Removing this file and trying to shrink by 2GB suddenly it worked! I had to do this process iteratively with larger partition shrink sizes and after about 5 shrinks I had 100GB unallocated disk space. YAY! Excellent write-up. 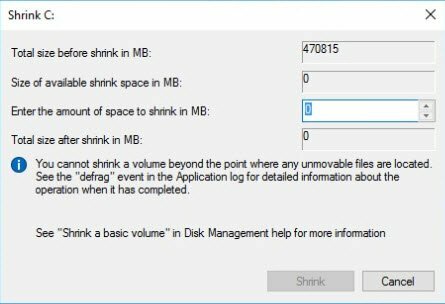 Like other commenters, I was encountering a message that there was not enough disk space after following your steps, I simply had to break my shrink operation in to 3 smaller chunks. Thanks for detailed instructions! This fixed my issue. 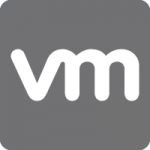 Thanks for this, it worked flawelessly, for anyone not working, run CMD in admin mode. Thank you!! OMG this was such an annoying thing to fix because I am just trying to dual boot and I had plenty of space. Screw windows for putting random files all over the place and making it difficult to do these. I was tempted to just overwrite windows with ubuntu but found your guide and it worked for me!